Crypto currency as a whole has been booming with new technology, and avid traders looking to cash in on the flow of money coming in – to the point where is now even a crypto trading bot that attempts to automate profits. We identified 1,045 US patents and published, pending applications specifically related to blockchain and distributed ledger technologies. Please note that our analysis does not include general cryptographic or encryption-related patents, such as for security and authorization, which do not involve a distributed ledger or decentralized concurrency methods. Based on our analysis, the major patent holders in this space are Bank of America, IBM, Mastercard, FMR LLC, World Award Foundation, TD Bank, Coinbase, 402 Technologies, Accenture, and Dell. The list includes entities from the financial services, traditional technology, patent holding and consulting industries. From the list of major holdings, 402 Technologies S.A., appears to be a patent holding company based in Luxembourg, and World Award Foundation / World Award Academy / AMobilePay, Inc. appears relatively obscure, and it is not clear what the company’s focus is. The various entities co-owning these patents are based in Tiburon, California and Austin, TX, and list an individual named Andy Zhou as their president. 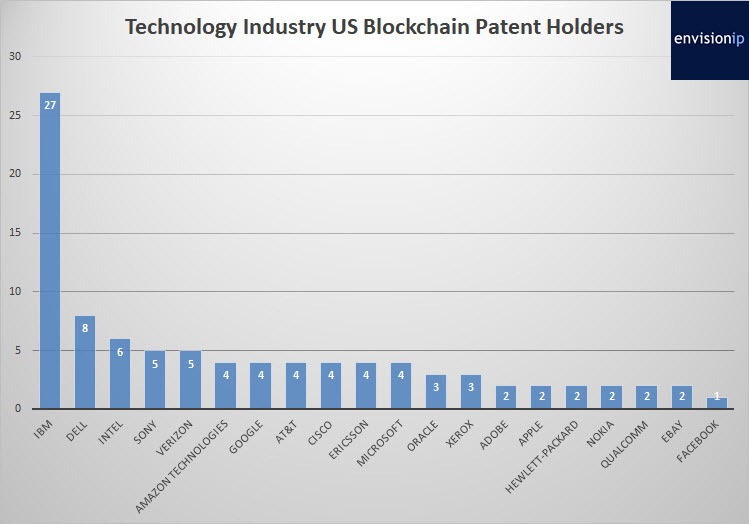 The financial industry dominates the list of the top ten blockchain-related patent holders. For the purposes of this analysis, we grouped patents and published applications together. Leading the list is Bank of America with 43 patents, MasterCard International with 27 patents, FMR LLC (Fidelity) with 14 patents, and TD Bank with 11 patents. 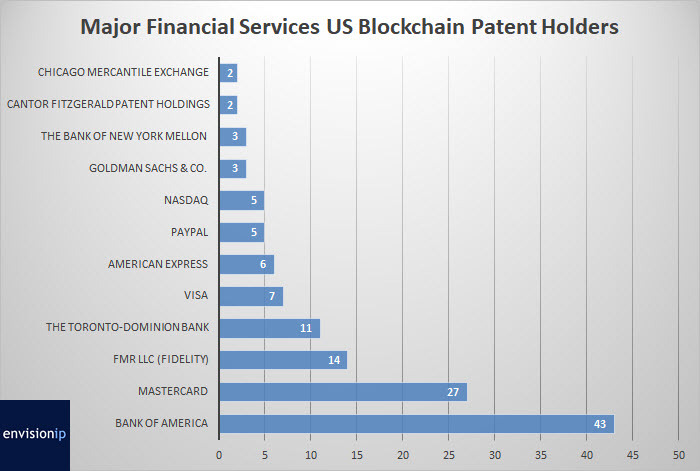 Other major financial institutions with blockchain patents include Visa Inc. with 7 patents, American Express with 6 patents, and Nasdaq Inc. with 5 patents. Interestingly, Nasdaq is not the only exchange which owns blockchain patents, and the Chicago Mercantile Exchange owns two patents in this space. However, these holdings are dwarfed by the leading digital currency exchange Coinbase, Inc., which owns 13 US patents. 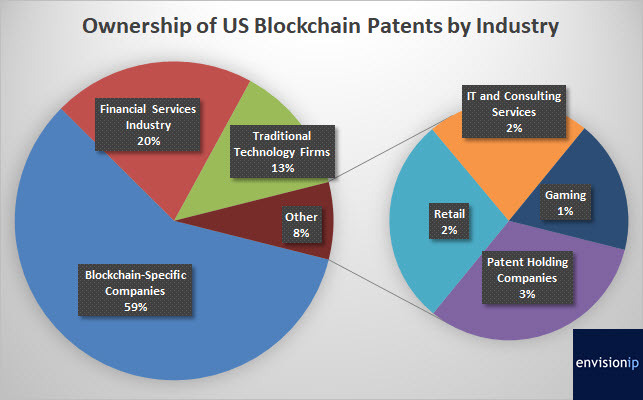 Blockchain-related startups and companies dedicated to developing technology, goods, and services in the blockchain and cryptocurrency ecosystem own approximately 59% of the US patents and published applications in this space. In addition to Coinbase, other blockchain-focused companies and individuals which are leading patent owners include Gideon Samid, the CTO of BitMint, and a member of the IOTA Foundation 8 patents), Monegraph Inc., a content monetization platform (7 patents), Digital Asset Holdings, a provider distributed ledger applications for financial institutions (6 patents), SKUChain, Inc., a blockchain-based supply chain technology company (6 patents), Medici, Inc., a crytpographic-security and distributed ledger developer (5 patents). The next largest industry group is financial services, which owns approximately 20% of the patents in this space. Traditional technology firms own approximately 13% of these patents, and a mix of patent holding companies, retail, consulting, and gaming/entertainment companies collectively owning 8% of the remaining patents in this space. The retail companies include Amazon Technologies with 4 patents, eBay with 2 patents, and Wal-Mart with 1 patent. 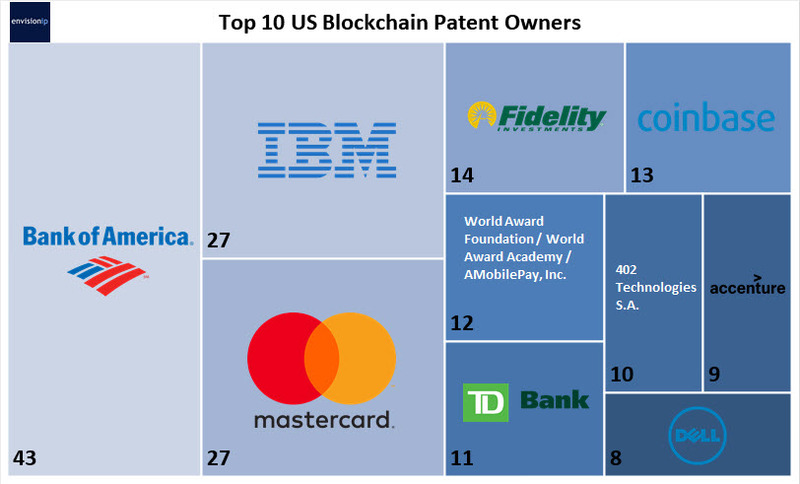 With respect to traditional technology companies, IBM is an outlier with 27 patents, and is tied for #2 on our list with MasterCard as a major US blockchain-related patent owner. However, Dell and Sony Corporation are the only large diversified technology companies within the top twenty patent holders on our list, with 8 and 5 patents respectively. Surprisingly, companies such as Google, Oracle, Microsoft, eBay, and Facebook, which inherently rely on complex databases, transaction accounting, and payment processing systems, do not appear very active in blockchain-related patenting. It is important to note that US patent applications typically become publicly available 18 months after their earliest filing date, so many companies we have identified in our analysis may have unpublished patent applications that are currently pending. We expect blockchain-related patent applications filings to continue at a increasing pace, as the technology and related standards gains adoption across multiple industries, and as cryptocurrencies become more mainstream and accepted as payment methods. In addition, as government regulation in this space is expected, this may give blockchain added legitimacy as a tool for secure transaction processing, accounting, and data management. Such regulation may inherently lead to continued filings as organizations looks to develop regulatory-complaint blockchain offerings. Love this market research. i am currently doing some research around patents and patents filings and would love to know where the filings could be found in relation to the companies in the market whom are developing in this space.